The most basic terminology question relating to the Moche is what to call them. Originally, thanks to a cultural template system of understanding people groups, there was no unified "Moche" -- only disparate groups defined by their artistic or technological style, e.g. the blackware culture (in part). As people began to grow suspect of defining a culture on purely material terms, these cultural name-tags have all but vanished. It has at times been fashionable to refer to the Moche as Yuncas (or Yungas), a generic term often used (generally incorrectly) to refer to all lowland peoples in the Andes region. This term is no longer popular because it is seen as too broad and perhaps inaccurate. For a long time it was the standard to call the Moche Proto-Chimu, Early Chimu, or Pre-Chimu, as comparative scholars saw many material and perhaps cultural connections between the two people groups. The latter (Pre-Chimu) would only be accurate, however, if the horizon cultures such as the Huari, who came between the Moche and the Chimu, were included. The former two (Proto-Chimu and Early Chimu) imply a relationship not of direct cultural succession, but rather that the Moche were simply an early stage of the Chimu -- and this is a relationship which has not yet been scientifically established. For many years, Mochica was in vogue, as it relates the Moche culture to the Mochica (a.k.a. Mochik or Muchic) language, but there is at this point no scientific reason to assume this relationship. 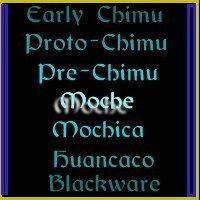 Therefore, following the tradition of naming cultures by their primary sites, Moche seems the most accurate label to use. On the other hand, that is only one site of many, and perhaps and the traditions do strongly favor their having spoken the Mochica language. There is therefore no easy choice between those two terms. It is probably less important an issue which you choose than to simply have good reasons for choosing that one. It is also essential that one is familiar with all these appellations, for older names do appear in many books and some museums. On the matter of what language they did, in fact speak, it is, as noted commonly thought that they spoke the Mochica (or Mochik or Muchic, etc...) tongue. The known history of that language would not even cover a page. It is known that at least the Chimu probably spoke it. There is a a grammar of the language by Carrerra (originally published in 1644 and reprinted in 1939), but before he could publish his more complete vocabulary of the language, he died, and the vocabulary went with him. There are partial lists from a few late nineteenth century observers, but by then the language was already disappearing. By the twentieth century, there were but a handful of natives who still spoke the dialect, and so the lists that we do have are very small, in deed. And, because of the time lapsed between the individual lists' creations, and the fact that it was a completely oral language, the lists we do have are semiconflicting -- e.g., one linguist writes a "ch," another an "sh," another an "ss." Also adding to the confusion is the opposite problem: allophonic deviation, meaning that one speaker may say a "ch," another an "sh," and another an "ss, for instance." A preliminary note on Keshwa words is in order. Keshwa or Quechua, the modern language of many Andean peoples, and presumably related to the language which the Inka themselves spoke, was originally an unwritten language. There is therefore some controversy as to "correct" spelling. There are those who prefer to use the traditional spellings and those who prefer a newer, "more linguistically correct" phonetic. When the Spanish began writing the words of this language down, they naturally made the words conform to the Spanish phonetic system so initial w sounds were transcribed as hu, which some say implies an incorrect aspiration prior to the vowel; somewhat guttural k sounds were written as qu, which is, linguists assure us much more clipped and pronounced more palatally. Many modern students of the language have attempted to correct some of these "inaccuracies." Unfortunately, this leads to a great deal of fluidity and therefore confusion when dealing with familiar names (as in Inca rulers') and terms (as in huaca). Futhermore, some -- though by no means all -- of these linguists are motivated primarily by a desire to cleanse all that is Spanish from all that is Indigenous, a questionable motivation for scholarly action. It should also be born in mind that no foreign phonetic system will ever accurately represent the language. The policy reflected in this document will be to list terms by their "modern" name with the traditional spelling in parentheses after. Suggestions as to which spelling should be preferred will be included where appropriate. Waka (trad. huaca or guaca) . . . This term is a difficult one and is easily misunderstood. Particularly for those of us with a western mind set, the waka concept is rather foreign. Early anthropologists and students of Andean culture once said that the people worshipped rocks and trees and called them huacas. Since then, it has generally been most fashionable to equate the term huaca or waka with temple, pyramid, or shrine. This, while somewhat less in the tradition of casting the Andeans as "rock-worshippers," does rather tend to put European constraints of holy-places and -objects on the waka concept, a concept which can, in fact, include less obviously sacred things, such as trees and rocks. At the core of the problem is a basic misunderstanding of how the word is used. When westerners hear the word waka applied to a structure like the Huaca del Sol, they immediately connect it to the western concept of temples and churches. When westerners hear the word used in reference to stones, "idols," trees or such things, they connect it with nature-worship. In truth, none of these things are waka: they have waka. When a building or "idol" is constructed and called waka, it not being termed such, but rather being said to have such. The term has no correlation in the English language, but might best be thought of as "holiness," not like "righteousness" or "nearness to the divine," but more like "possessing a portion of divinity." This is not the best, most refined definition possible, but it does serve to clarify some issues of Andean belief systems. But what of ancestors? Sometimes called ancestor spirits and sometimes called ancestor mummies, there is also a strong undercurrent in Andean belief to regard as waka the powerful spirits of past family progenitors. This is a difficult question which I am not prepared at this point to answer: do the ancestors have this apportionment of divinity which can be called waka, or are they, in fact, apportionments of divinity and therefore called waka themselves. I tend towards the latter, partly because of the readings in the Huarochiri manuscript which suggest that some waka rocks/objects received their holiness either because they were inhabited by ancestor spirits, or because ancestors transformed into these objects. How then should the term be used? I prefer to split the two spellings into two slightly different terms. Huaca I use to indicate structures, monuments, places, etc..., and thus maintain the word in what has become its regular and common use. I use the other, waka in the spiritual sense, to describe the perhaps more accurate concept which underlies the holiness of those structures, monuments, and so forth. I owe much of this to the mentoring of Michael Czwarno who, in a brief amount of time, showed me much about the Andean mind. Any mistakes or misconceptions, however, are entirely of my own concoction. Twirl-sticks . . . "Twirl-sticks" are shown in several festal drawings, and are thought to have been found in some graves (it is not certain if these are the same twirl-sticks illustrated in art). Physically, twirl-sticks are perhaps yard-long slats, or rods, of wood with twine-binding covering a few inches of the middle. If they were slats, it is important to note that the width and thickness could not be very much -- probably no more than an inch for width, and no more than a couple of centimeters in thickness. No matter if slat or rod, the ends of the twirl sticks were capped off by slats (or perhaps, but not likely, rods) of only a few inches in length. To use the twirl-sticks, the person would hold onto the end of the twine-binding, and then toss the twirl-stick upward, the stick spinning pleasantly until it came to the end of the binding, at which time it presumably fell to the ground. It is thought that these were used for celebration, but they may been been used in rituals, or perhaps in a manner like gavels. Warrior Priest . . . This is a term used quite often in studying the Moche, especially but not exclusively in regards to a particular figure buried at Huaca de la Cruz. The term is both highly representative and a little misleading. The central idea behind the term, though, is to reflect the fact in Andean civilizations, probably including the Moche, the "ruler" was a Ruler, a Warrior, and a Priest -- in that he led the people by governing, by doing battle, and by performing religious rituals. The Inca (i.e. the head of the Inca state) performed all three of these, at least since the time of Pachacuti Inca Yupanque (see Betanzos, Narrative of the Inca), and it is likely that this was the Andean pattern. The complication is that in the Andean mindset these functions are not really separate and therefore, using a term that (a) leaves one of the three out and (b) still seems to imply separate activities for the other two is not very helpful. The ruler simply led his people in all things by being the "ideal" person, in many ways -- often because he was divine, or of divine origin. Since all things are part of life, the ruler simply led the "state religion" by being the "first among worshippers and practitioners." He was also the "first among soldiers" and the "first among bureaucrats." But, in addition, he was the "first among farmers," the "first among builders," the "first among eaters," etc... He was simply the FIRST. The term Warrior-Priest attempt to show this dual or multiple role, but, in my mind, succeeds more in dividing it. My preference is to use the Mochica (i.e. Mochik) word for "chieftain: alaec. Diffusion . . . Diffusion is the movement of artifactual ideas (mental templates) from one culture to another. If this movement involves large population movements -- such as military conquest or migration - it is called primary diffusion. If this movement is the result of subtle movement such as exogamy, trade, or personal visitation, it is then called secondary diffusion. Retrodiction . . . Retrodiction is a complex word used by a small circle of scholars to explain a complex process of understanding pre-historic cultures. Another term for the process is "forced analogy." The process which these terms try to describe is that wherein an archaeologist examines anthropological or historical sources and uses that data to explain similar things seen in the archaeological record. The method of study unfolds something like this: (1) the archaeologist sees a painting of a man wearing a lion's head cap; (2) the archaeologist reads about current people in that area who believe that lions' spirits are strong and courageous; (3) the archaeologist reads historical accounts about a previous culture in the area who practiced a form of sympathetic naturalism wherein in people would adorn themselves with animal pelts to take on the spirits of those animals; (4) therefore, the archaeologist postulates that the painting of a man with a lion's head cap is part of a shamanistic ritual, and that the shaman depicted is trying to infuse himself with the spirit of a lion and thereby gain the lion's power and bravery. Such a process is often necessary to understand the material remains of a culture concerning whom there is no other primary evidence. It must be undergone with great caution, however, and the results of such study should be given in a qualified fashion, never with absolute certainty.